Adopt a Polar Bear today at udopt.co.uk. A cuddly polar bear toy. A polar bear factbook together with bookmarks and stickers. Two exclusive magazines: WWF’s ‘Wild World’ and ‘My Polar Bear’ with news and updates for your adopted animal. Polar bears roam around the Arctic landscape with their young after a winter in hibernation. They are solitary creatures, and tend to only mix with other bears during mating season. They love to spend time with their families, but as global warming takes hold, their natural habitat is slowly disappearing. 70% of all polar bear babies don’t make it to their 3rd birthday. Your adoption will help towards a range of Arctic programmes that help to conserve the region’s rich biodiversity, respecting the local ecosystems. How to adopt a polar bear? Adoption programmes start from as little as £3.00 a month. The polar bear is the world’s largest predator, and can grow up to 10 feet tall and weigh over 1400 pounds! When born, a baby polar bear is much smaller than a human baby, and can weigh as little as 1 pound. A polar bear’s fur is actually clear and not, as your eyes tell you, white. This visual illusion is caused by the light reflection of its transparent hairs. Bet you didn’t know that! The hair is also water repellant, meaning that ice and water are easy to shake off and the hair doesn’t knot. Polar bears have slightly webbed toes and paddle with their front feet whilst steering with their hind feet. They can also swim up to an amazing 100 miles in one go! Please help me, I may be big and furry but I need looking after too. My home is slowly being destroyed by climate change, and food is becoming harder to find. Many of our babies don’t see their third birthday due to a lack of food and the dreaded hunters. Please adopt me today and help us to find our feet again before the ice melts beneath us because of pollution and global warming. We desperately need your help. Although they are classified as land animals, polar bears spend most of their day swimming along arctic coast lines in search of food. When they aren’t swimming, polar bears are trekking over arctic ice sheets or playing with their cubs. The study of these animals in their natural habitat has revealed many interesting facts about the polar bear. Polar bear mothers are very nurturing. Cubs are usually born as twins that are each no bigger than a hamster. 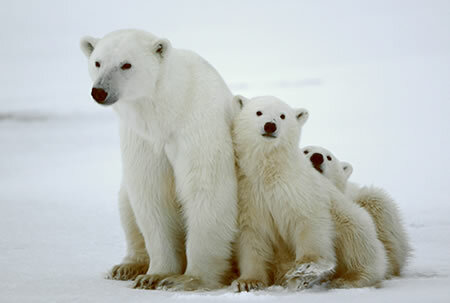 Mothers feed their children a very rich, fatty milk to help them grow quickly and be prepared for their arctic habitat. Cubs stay with their mother until they are over five hundred kilograms. Male polar bears are less family oriented than the females. They spend their time wandering alone and only approach the females to mate. They have no involvement with the cubs. Staying clean helps the bears to stay warm. Clean fur insulates better and conveys more of the sun’s warmth to the bear’s body. Polar bears stay clean by rolling in snow to scrub dirt out of their fur. As the largest carnivorous land animal, polar bears must dedicate a great deal of time to finding enough food to feed their massive bodies. The energy demands on their bodies are intensified by the freezing environment. Temperatures often drop to less than thirty degrees below Celsius. With frequent trips in and out of the arctic waters, polar bears need high energy foods. Most of this energy comes from consuming seals. Often, the bears will eat all the fat from a seal and leave the remains for scavengers such as the arctic fox. Polar bears hunt for seals along the edges of sea ice and by waiting beside the seal’s breathing holes. The seals are killed when they come up for air. Bears will hunt seal pups by digging out their dens. Despite their strength and power, hunting is very difficult for the bears and they are only successful in one out of fifty hunts. In times of scarcity, the bears will also eat fish, berries, reindeer or they will scavenge for dead whales. In northern communities, bears will scavenge for food in human garbage dumps. Polar bears are endangered and the recovery of their population is difficult in such a harsh environment. 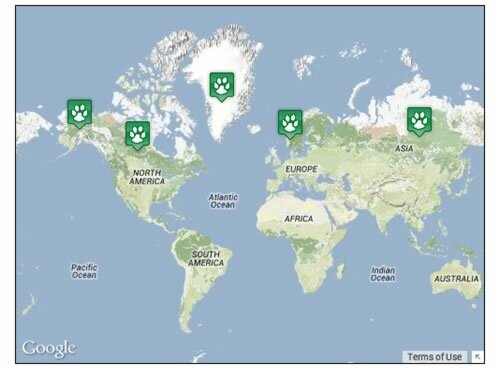 Many zoos support the species through public education and polar bear adoption programmes. Even though I spend my days swimming in freezing arctic waters, wandering on ice and rolling in snow, I actually feel quite warm. In fact, I have to be careful that I don’t overheat. You see, my fur and skin is made in a special way that attracts heat and helps me to be warm. I might look like I have white fur, but it’s an illusion. My fur is actually transparent, like glass but softer. And each hair is a hollow tube. So when the sun shines on me, my fur reflects the light and what you see is the colour white, just like ice cubes and diamonds look white but when you get close you can see right into them. All of my skin is black. When the sun shines on me, my fur reflects the sunlight and heat into my black skin. Things that are black absorb heat from the sun really well. So even though the sun isn’t very strong in my homeland, it still warms me up quite a bit. I am a really good swimmer. My front legs are really big and strong and my toes are webbed. This helps me pull myself through the water. I use my back legs to steer, like a rudder on a boat. I can hunt while I’m swimming and even kill a seal while I’m underwater. Sometimes fishing boats see me and I’m over a hundred miles from the nearest land. I also have a good sense of smell. This helps me with hunting for seals. I can smell my prey from a mile away. This helps me find the places where they come up for air and wait for them. They are underwater so they can’t smell me or see me until they come up to breathe. This gives me an advantage. My life is really long for a wild animal. I’ll start getting old when I am twenty-five and, if I am lucky, I will live thirty years. But there are also reasons I might not be lucky. Life is hard in the arctic and my friends and I are endangered. Despite being at the top of their food chain, the world’s polar bears are under threat from pollutants that find their way into food they consume. There habitat is also disappearing due to climatic changes brought on by global warming. They need your help. 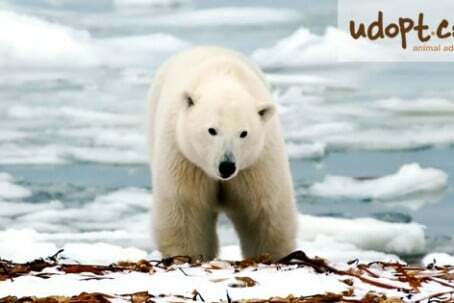 There are many facts about the polar bear that need to be known in order to understand why they are endangered. Being at the top of the food chain is also one of the reasons that polar bears are endangered. Pollutants from ships and shoreline industry contaminate fish. Seals consume large amounts of fish and, over time, accumulate high concentrations of toxins in their blubber. When the polar bear consumes a diet high in seal blubber it is exposed to high concentrations of pollutants. Bears can die directly from this pollution or be weakened enough that they succumb to other dangers. 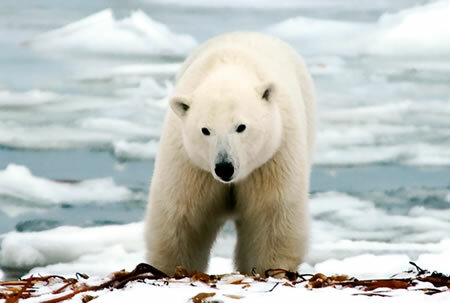 Pollution in the water can also damage the polar bear’s fur and irritate the skin. Oil spills from boats float on top of the ocean and get onto the bears as they swim. The sticky oil destroys the fur’s ability to insulate and absorb heat from the sun. It can also cause the fur to fall out and expose the bear to freezing temperatures. Global warming is the polar bear’s biggest threat. Summer is starting earlier and lasting later into the year. This means that the sea ice melts earlier and freezes later. There is less time for the bears to hunt and feed so they are not gaining as much weight as they should each season. This makes it harder for them to survive the summer season when it is more difficult to hunt. Warmer temperatures also make the arctic more habitable for other species. Grizzly bears are gradually moving into polar bear territory. Grizzly bears finish their hibernation before polar bears and this gives them an advantage in the competition for prey. It is harder for the polar bears to find enough land animals to hunt when they are competing with another species. When bears can’t find enough food through hunting, they start visiting human garbage dumps. They come into conflict with people and have to be destroyed before they hurt someone. Today there are less than twenty-five thousand polar bears in the world. Polar bears are endangered and they need help to survive. Public education and wildlife programs are supported through the giving of polar bear adoption gifts. Polar bear adoption is one of the best ways to help to protect the species. 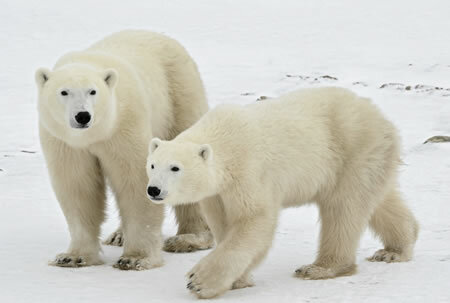 Of the eight species of bears inhabiting our planet, the polar bear is the youngest and the largest. It occupies an extreme ecological niche, in fact no other mammal, except for the Arctic fox, can penetrate as far into the Arctic Ocean. The size and weight of the polar bear is impressive. Adult males can measure up to 10 feet, excluding the tail, and can weigh up to 2200 pounds. Equally impressive is its strength which ranks among the strongest terrestrial predators. Perfectly adapted to its harsh environment, the polar bear remained unthreatened in its Arctic stronghold until the ambitions and greed of the civilized world shattered the equilibrium of the North. Exterminated almost to extinction in the course of Arctic conquest by humans, then partly recovered during many years of strict protection, the polar bear remains a fragile species in our modern world. Its future is in our hands. By adopting a Polar Bear you are helping to support the work of conservation groups, providing vital funding necessary to carry out their campaigning and efforts to improve and preserve the wildlife and their habitat. Help to make a difference in the future survival of the animals by adopting a polar bear today. Polar bears can be found along coastlines throughout the Arctic Circle.